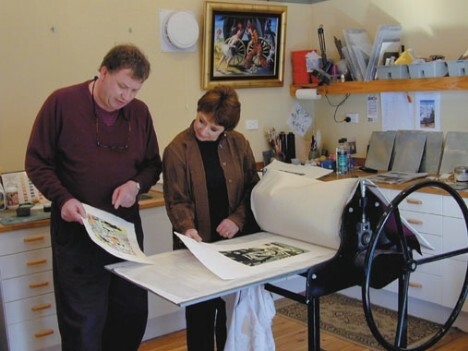 PHOTO: Bernard Ollis and Anne Smith working on a series of Bernard's etchings in Anne Smith's etching studio. Bernard Ollis was Director of the National Art School, Sydney for 12 years. Born in Bath, England, Ollis is a graduate of Cardiff College of Art and Design, Wales, and received his Master of Art (Painting) from the Royal College of Art, London. He arrived in Australia in 1976 and lectured at the University Northern Territory and La Trobe University, Bendigo, Victoria, before being appointed Head of Painting at the National Art School in 1996. He became Director in 1998. Bernard Ollis has had annual solo exhibitions since 1972, including at Macquarie Gallery, Sydney, Powell Street Gallery, Melbourne, and more recently at Australian Galleries, Michael Nagy Fine Art and Stella Downer Galleries. He has been a finalist in the Sulman Prize at the Art Gallery of NSW and participated in group exhibitions throughout Australia. Ollis undertook a residency at the Cite Internationale des Arts, Paris (1975), and has been awarded numerous art prizes and awards, which include the 1976 John Minton International Painting Prize, the 1977 Sir Frederick Richards’ Travelling Scholarship (UK) and an Australia Council Visual Arts Board Grant (1984). He was a finalist for the Doug Moran Portrait Prize in 2004. He is represented in public collections in Australia and the United Kingdom, including the National Gallery of Australia, Parliament House, Canberra, and the state galleries of Queensland, Victoria and Northern Territory.